The Berliner is a delicious, fluffy, enriched yeast doughnut traditionally served fresh as a carnival treat. Aside from carnivals, they are something my mum used to make the family on special occasions during the weekend. We’d generally sit around the table and eat them all in one sitting. 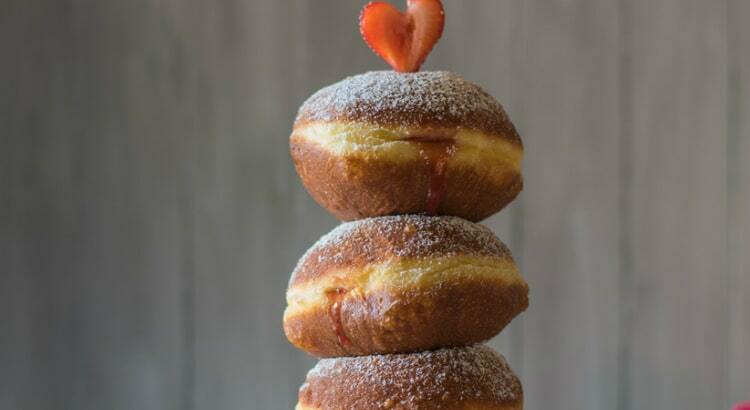 My Berliner doughnuts are an adaptation from my mother’s old Backen Macht Freude recipe book using home made strawberry jam and a romantic floral addition of fresh rose petals. I’m a self confessed bakeaholic, with a love of everything about food—it’s heritage, flavour, beauty and ability to spread joy. A mum, a doctor by day, and a baker, blogger, recipe developer and food photographer by night (and on the weekends), my baking addiction started in my German mother’s kitchen and through my family’s love of good hearty food and enjoying it together and in abundance. Although I was born in Melbourne, Australia, I have been so lucky to have grown up with the traditions of my German heritage and loved making and cooking authentic German food, especially cake. The Germans are great at cake! Food has always been an anticipated ceremony in my family where afternoon visits for instance always meant kaffee and kuchen (coffee and cake) and not just one, often two or three cakes, as well as incredibly strong percolated coffee, and often something a little stronger. In 2018, I took my love of baking to another level and was lucky enough to have won “The Great Australian Bake Off”. I now blog on the sugarologist.com where I create and share new bakes combining elements of my German heritage with baking from all corners of the globe, embracing seasonal ingredients and combining amazing flavours. 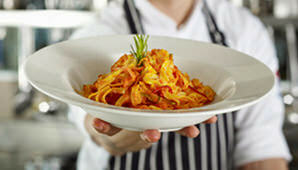 Discover more food secrets from Claudia’s German heritage at our exclusive workshop. Learn more here. In a large mixing bowl, whisk together the flour and yeast to combine. Make a well in the centre. Melt the butter and cool to just warm. Heat the milk to lukewarm or about 37C. Mix together the milk, butter, vanilla, eggs and egg yolk, lemon zest, and sugar. Pour into the well and sprinkle the salt around the edges. Stir all the ingredients together to moisten then knead using a stand mixer with a dough hook attachment until smooth and elastic (around 6 minutes). This can also be done by hand and will take around 8 minutes. Move the dough to a clear oiled bowl and cover in cling wrap. Allow to prove in a warm place for about one hour until the dough has doubled in size. Empty the dough onto a bench that has been very lightly dusted with flour and divide it into equal sized portions. I used 80g portions which makes around 10 doughnuts. Roll each portion into a smooth ball by tucking the edges under then rotating on a clean bench using a cupped hand until you have a nice round shape. Place each ball onto a tray covered with a piece of baking paper with a good amount of space between for rising. Dampen a clean tea towel using warm water and cover the balls. Allow to prove again until they have visibly risen. Heat a deep fryer or large saucepan full of clean oil such as canola to 170-175C degrees. Fry 2 to 3 doughnuts at the time for 2-3 minutes each side until golden. 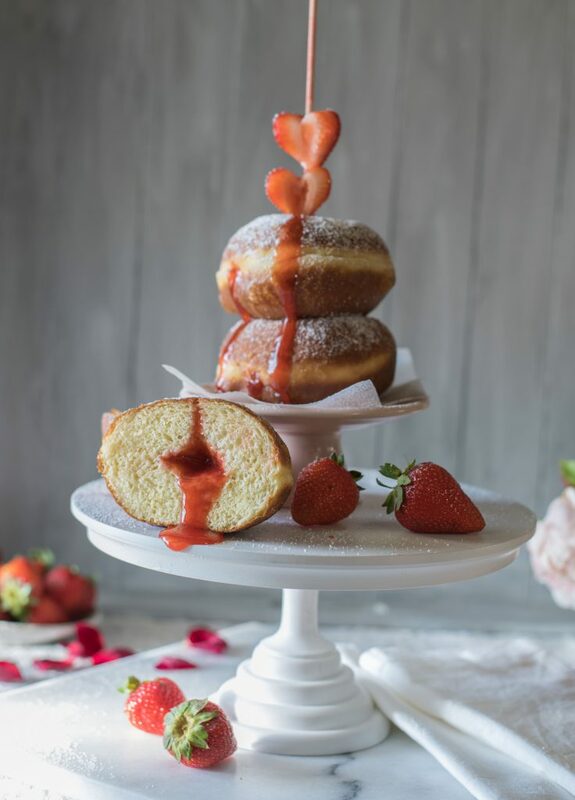 Fill the doughnuts with the jam by cutting a slit in the side using a pointy knife and using a syringe or a piping bag fitted with a round nozzle to squirt the jam in. Dust with icing sugar and serve them while they are still fluffy and warm. Tip: Alternatively, the berliner can be rolled in caster sugar or drizzled with icing. They are also delicious filled with custard. Puree the strawberries in a blender with 350g of the sugar and the lemon juice. Transfer to a saucepan and bring to a gentle boil. Boil for 6 minutes on low heat. Trim the white parts of the rose petals and tear the larger ones into pieces. Mix the pectin with the remaining sugar and whisk into the jam after the 6 minutes are up. Add the rose petals and boil for another minute whilst stirring. To test if the jam is ready, spoon some onto a chilled saucer. If it starts to thicken and form a skin, it is ready. Pour the jam into a sterilised jar and chill to set. Tip: The jam can be made the day before to give it time to cool and set. Make sure you store it in the fridge as it is relatively low in sugar compared with regular jam.